Hello, long time no see, I’m not around after 2 years there’s so many blah blah blah outside there. After long time without vector or digital painting i want to present something different. This wall start from February 2011 (just work on weekend or holiday only) so why this making of wall meet some frustrating point when worked on some parts. Fights end at August 2011, but some refinement more and more and finally delayed on September (though I’m still need to fix some parts) i’ve bored already, so let me judge it “finish”. Started sketched Midori Miyazawa (character from visual novel natsu no ame) on blank A4 and send them to old scanner. I’m use her for energetic characteristic so suit with summer theme. Added with sports stuff, essentially bicycle. I’m don’t know why I’m choose bicycle, maybe coz I’ve got unsatisfied result when draw bicycle so keep trying to make them better as i can. I’m not have many knowledge about bicycle and it’s components, just googling for some popular bicycle pics on web for vectored. Credits belong to Charfades from deviantART for his grass brush. The original is 6400 x 4000 px, trying to upload it with error message "Image too large in dimensions, maximum amount of pixels is 10000000", even my filesize under 15mb, so i just put smaller version. After over 2 years of inactivity, minamiyukihimenonaka comes back to Minitokyo with a vivid, mind-blowing piece of artwork. A closer look at this will instantly reveal the beautiful vectoring, smart lighting, and an astonishing amount of realistic details ranging from weathered appearance of the bike route sign to the logos on the water bottle and bicycle. Proposed by SolemnSerpent and highlighted by Bernouli. Absolutely stunning; I can't believe how much work you put into this - I'm completely blown away. The details on the bike and water bottle is great; the added logos gives it an authenticity and realism that I appreciate. Also, the attention to lighting, in regards to the shadows sat by the trees is one of many other details that makes this feel complete. Astonishing work, you've certainly earned a +watch from me. This wallpaper needs more love. I wonder why people aren't noticing it that much. It looks beautiful. Well honestly, when i looked at the thumbnail it look pretty much normal. But once i clicked on fullview, it really does strike as amazing! I like all the little details you've put into everything from the textures on that wall and those rocks to the tiny little details on the helmet and the rusting on the bike. wow! no matter where i look at, i find something even more astonishing! incredible how much attention you paid to every little detail! but then again, truly stunning! the details although there are some parts which need some fixing. please don't be on hiatus again and make more! >w< +favs! The amount of details is really impressive. I speechless to describe how amzaing it is. AMAZING! The details in it really are .... don't know what to say @_@ am AMAZED! Awesome piece of art. Extremely impressed at the workmanship. Sweet theme as well. Thank you so much for the share and welcome back. Hope to see more of your work soon. I enjoy about this vector very much.I think this is a professional vector art work. Excellent detail with real senses. logos on parts of bicycle pull the eyes with themselves. Thanks for sharing this great job. very very nice^^ go on! love it! Just wow, such incredible work here! Wow! The details and all the little ity bity pieces you put into this are just mind blowing when in full view. Incredible! Lovely work! 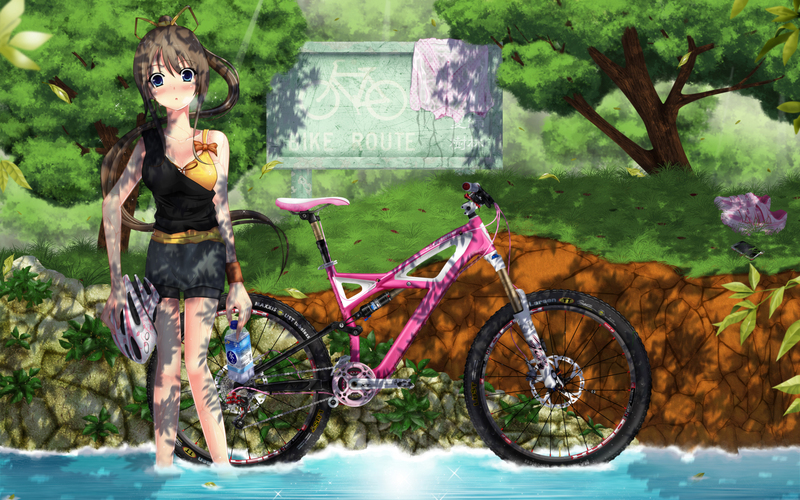 Hmmm... a bit confused why a bicycle is down in the water? Also, the tires are just barely in the water while her feet (and possibly shoes) are completely submerged in the water and this just doesn't make sense. Does the water level really drop that quickly?